The last show with Izzy as a band member. He would return to play occasional shows later, stepping in for Gilby or joining future lineups. I remember watching parts of this show broadcasted live on MTV Music Awards. Good times. I wish I could see some footage of this show on this night. Just skip forward on the Youtube video and you will come to 'Live And Let Die' which was broadcasted. SO FINALLY they came, we saw, and we left, not much the wiser. 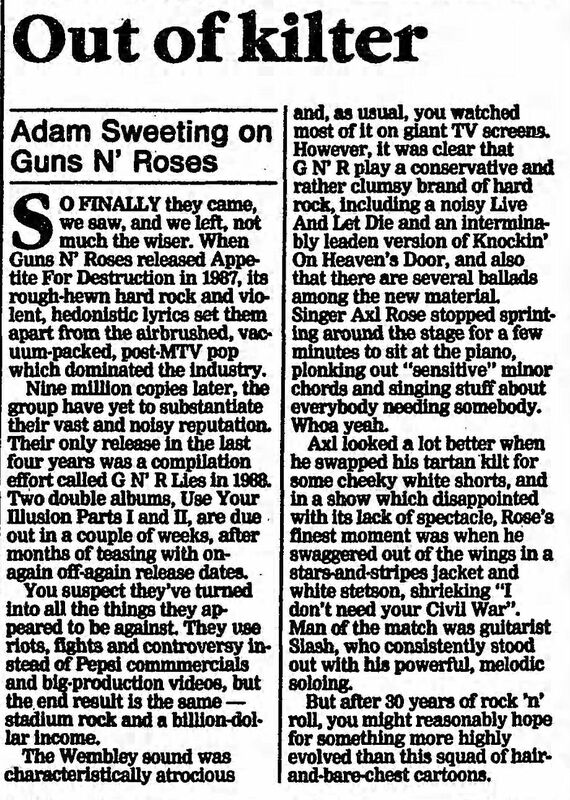 When Guns Ν' Roses released Appetite For Destruction in 1987, its rough-hewn hard rock and violent, hedonistic lyrics set them apart from the airbrushed, vacuum-tacked, poet-MTV pop which dominated the industry. Nine million copies later, the group have yet to substantiate their vast and noisy reputation. Their only release in the last four years was a compilation effort called G Ν’ R Lies in 1988. Two double albums, Use Your Illusion Parts I and Π, are due out in a couple of weeks, after months of teasing with on-again off-again release dates. You suspect they’ve turned into all the things they appeared to be against. They use riots, fights and controversy in-stead of Pepsi commercials and big-production videos, but the end result is the same— stadium rock and a billion-dollar income. The Wembley sound was characteristically atrocious and, as usual, you watched most of it on giant TV screens. However, it was clear that G Ν’ R play a conservative and rather clumsy brand of hard rock, including a noisy Live And Let Die and an interminably leaden version of Knockin' On Heaven’s Door, and also that there are several ballads among the new material. Singer Axl Rose stopped sprinting around the stage for a few minutes to sit at the piano, plonking out “sensitive" minor chords and singing stuff about everybody needing somebody. Whoa yeah. Axl looked a lot better when he swapped his tartan kilt for some cheeky white shorts, and in a show which disappointed with its lack of spectacle, Rose’s finest moment was when he swaggered out of the wings in a stars-and-stripes jacket and white stetson, shrieking “I don’t need your Civil War". Man of the match was guitarist Slash, who consistently stood out with his powerful, melodic soloing. But after 30 years of rock 'n' roll, you might reasonably hope for something more highly evolved than this squad of hair-and-barechest cartoons.